Christen Press scored her first goal of the season as Utah Royals FC beat Sky Blue FC 3-1 on Saturday night at Rio Tinto Stadium in Sandy, Utah. Utah Royals FC are now 5-3-6 with 21 points and in fourth place in the NWSL standings. The loss drops Sky Blue FC to 0-10-3, the longest winless streak to start a season in NWSL history. Press opened the scoring in the 7th minute, tapping in a Katrina Gorry cross that skipped through the box. It’s Press’ first goal of the 2018 season and her first career goal for any team other than the Chicago Red Stars. Press made her 2018 season debut on Wednesday, playing all 90 minutes, before finding her first goal on Saturday night. Press now has 36 career regular season goals — fourth all-time in NWSL history — in 62 games. After Press opened the scoring, Katie Stengel scored two goals in four minutes to give Utah a 3-0 lead. Her first came in the 25th minute, running onto the end of a through ball down the middle from Press. Stengel started up top alongside Press as Amy Rodriguez had the night off. Her second goal came in the 28th minute, a header on a free kick from Gorry. 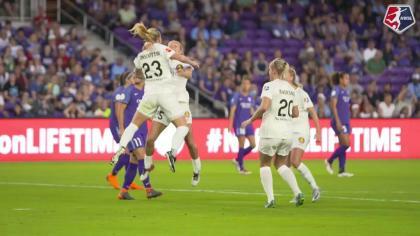 A Carli Lloyd foul on Gunnhildur Jónsdóttir set up the free kick from about 30 yards out. Stengel’s brace is the first in Utah Royals FC history. In 83 minutes, Stengel had three shots, two on goal and two chances created. Lloyd got one back for the visitors in the second half, a bending shot as she fell that beat a diving Abby Smith into the upper left corner of the goal. Smith made a big kick save on Shea Groom just a moment earlier, but the ball stayed in play and eventually fell to Lloyd. Sky Blue thought that had another in the 78th minute — a Savannah McCaskill goal on an assist from Lloyd, but McCaskill was ruled offside on the play. Sam Johnson started at center back alongside Becky Sauerbrunn, her first minutes since joining Utah. Johnson made five clearances and three interceptions. Sauerbrunn had three clearances, four interceptions and one block. Press played all 90 minutes again for Utah, finishing with four total shots, one on goal and one chance created. Utah Royals FC will next head to Providence Park to take on the Thorns on Friday night. Sky Blue FC will host the Chicago Red Stars on Saturday night. Match ends, Utah Royals 3, Sky Blue 1. Second Half ends, Utah Royals 3, Sky Blue 1. Attempt missed. Michaela Abam (Sky Blue) right footed shot from more than 35 yards misses to the left. Gunnhildur Yrsa Jonsdottir (Utah Royals) is shown the yellow card. Corner, Utah Royals. Conceded by Madison Tiernan. Erika Tymrak (Utah Royals) is shown the yellow card for a bad foul. Foul by Erika Tymrak (Utah Royals). Corner, Utah Royals. Conceded by Erica Skroski. Mandy Freeman (Sky Blue) is shown the yellow card for a bad foul. Christen Press (Utah Royals) wins a free kick in the attacking half. Substitution, Sky Blue. Thaisa replaces Shea Groom. Corner, Utah Royals. Conceded by Dominique Richardson. Substitution, Utah Royals. Sidney Miramontez replaces Katie Stengel. Attempt missed. Carli Lloyd (Sky Blue) right footed shot from outside the box is high and wide to the right. Assisted by Sarah Killion. Offside, Sky Blue. Carli Lloyd tries a through ball, but Savannah McCaskill is caught offside. Shea Groom (Sky Blue) wins a free kick in the attacking half. Offside, Sky Blue. Madison Tiernan tries a through ball, but Michaela Abam is caught offside. Attempt saved. Erika Tymrak (Utah Royals) right footed shot from outside the box is saved in the bottom right corner. Assisted by Katie Stengel. Offside, Sky Blue. Shea Groom tries a through ball, but Carli Lloyd is caught offside. Substitution, Utah Royals. Rachel Corsie replaces Katrina-Lee Gorry. Substitution, Sky Blue. Michaela Abam replaces Imani Dorsey. Attempt missed. Katrina-Lee Gorry (Utah Royals) left footed shot from the left side of the box is close, but misses to the left. Assisted by Katie Stengel with a through ball. Attempt blocked. Christen Press (Utah Royals) left footed shot from the right side of the box is blocked. Assisted by Desiree Scott. Attempt blocked. Shea Groom (Sky Blue) right footed shot from outside the box is blocked. Attempt missed. Christen Press (Utah Royals) right footed shot from outside the box is close, but misses to the left. Goal! Utah Royals 3, Sky Blue 1. Carli Lloyd (Sky Blue) left footed shot from outside the box to the top left corner. Assisted by Imani Dorsey. Attempt saved. Shea Groom (Sky Blue) left footed shot from the centre of the box is saved in the centre of the goal. Assisted by Janine Beckie. Attempt missed. Janine Beckie (Sky Blue) right footed shot from outside the box misses to the right. Samantha Johnson (Utah Royals) wins a free kick in the defensive half. Substitution, Utah Royals. Elise Thorsnes replaces Rebecca Moros. Attempt missed. Christen Press (Utah Royals) left footed shot from outside the box is too high. Delay in match Shea Groom (Sky Blue) because of an injury. Corner, Utah Royals. Conceded by Janine Beckie. 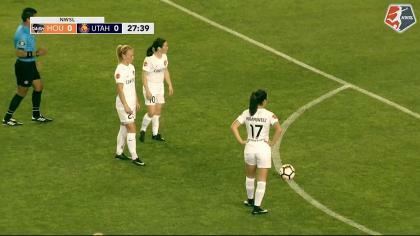 Katrina-Lee Gorry (Utah Royals) wins a free kick in the defensive half. Substitution, Sky Blue. Savannah McCaskill replaces Amanda Frisbie. Second Half begins Utah Royals 3, Sky Blue 0. First Half ends, Utah Royals 3, Sky Blue 0. Gunnhildur Yrsa Jonsdottir (Utah Royals) wins a free kick on the left wing. Attempt missed. Erika Tymrak (Utah Royals) right footed shot from the right side of the box is high and wide to the right. Assisted by Gunnhildur Yrsa Jonsdottir. Attempt saved. Katie Bowen (Utah Royals) right footed shot from outside the box is saved in the top right corner. Assisted by Katrina-Lee Gorry. Offside, Sky Blue. Janine Beckie tries a through ball, but Madison Tiernan is caught offside. Goal! Utah Royals 3, Sky Blue 0. Katie Stengel (Utah Royals) header from the centre of the box to the top left corner. Assisted by Katrina-Lee Gorry following a set piece situation. Goal! Utah Royals 2, Sky Blue 0. Katie Stengel (Utah Royals) right footed shot from the centre of the box to the bottom left corner. Assisted by Christen Press with a through ball. Katie Stengel (Utah Royals) hits the right post with a right footed shot from a difficult angle on the right. Offside, Utah Royals. Katie Bowen tries a through ball, but Christen Press is caught offside. Goal! Utah Royals 1, Sky Blue 0. Christen Press (Utah Royals) left footed shot from the left side of the six yard box to the centre of the goal. Offside, Utah Royals. Katie Bowen tries a through ball, but Katie Stengel is caught offside.